Growth in home improvement activity is expected to peak during the second half of 2014 and then begin to ease heading into next year, according to the Joint Center's latest Leading Indicator of Remodeling Activity (LIRA). Revised estimates from the U.S. Census Bureau show the home improvement market grew 5.6% in 2013. * For 2014, the LIRA projects annual gains in home improvement spending of 9.9% with annual growth slowing to 7.0% in the first quarter of 2015. With the economy improving slower than expected and home sales struggling to keep up with last year’s pace, the recent strong gains in remodeling spending will likely moderate later this year. Although this presents a challenge for the remodeling industry, the LIRA continues to project significant growth going into 2015 and there continue to be promising signs for remodeling, as contractor sentiment remains positive and house prices continue to rise in most areas of the country. 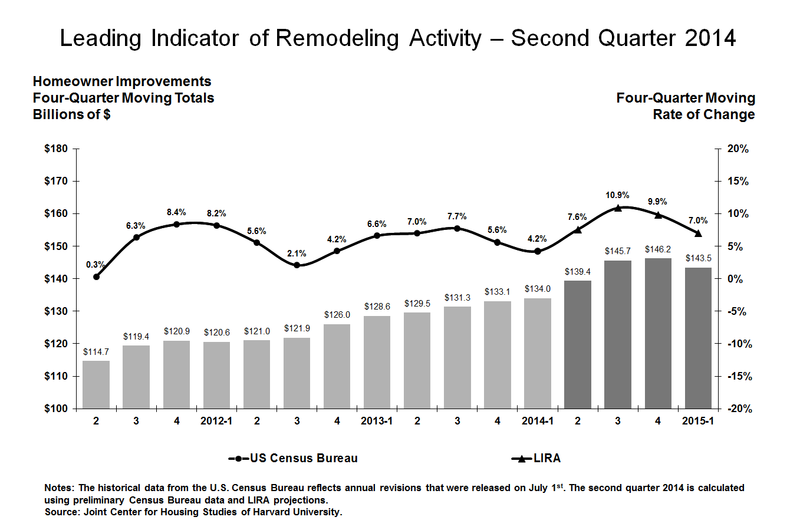 *On July 1, the U.S. Census Bureau released annual revisions to the home improvement spending data to which the LIRA is benchmarked. These revisions, going back to January 2012, significantly restated improvement spending for the second half of 2013 when initial data collection by the Census was impacted by the October 2013 government shutdown. This LIRA release incorporates the newly revised historical data from the Census. For more information about these revisions, please visit: http://www.census.gov/construction/c30/pdf/release.pdf. Interactive Map: Where Can Renters Afford to Own?